When we decided to put a bed in my craft room so that guests would have a place to sleep, we just put our old comforter in there. It was a purple comforter that we had when we were still in the purple room. When we first moved in it was perfect because it matched the carpet and walls of the room that my hubby and I took. We let The Builder have the bigger room in the house because we knew that we had the intention of building on to our house. Then, when we moved into our new Master Bedroom, Future Fashionista would end up with the purple room. That saved us from having to paint the purple room. We weren't intending to change the purple carpet any time soon, and what other color would go with purple carpet?!?! When we moved into our new Master Bedroom, we had all neutrals and I bought myself a black and tan comforter for Christmas that year. The purple comforter got put away to become an extra layer of heat in the Winter time. And then, as I said, it became the comforter in the craft room once we put a bed in there. BUT, I really didn't like the color of the comforter in the craft room because it's already a small room. Keeping the colors in the comforter and the walls the same help make the room appear larger and more relaxing. I needed a frugal way to be able to cover the comforter and create the relaxing room that I wanted. I needed a way to do it without spending any new money! So, I used stuff I already had in the house. I originally bought the twin-sized green sheets that I used in this project to cover the shelves in my craft room so that it wouldn't seem like all of my stuff was closing in on my guests. But, it didn't work out the way I wanted it to at the time and the sheets ended up back in my closet. I had the tan king sized sheet that I used as the backing because I bought a king-sized sheet set to go on the old air mattress that we used to have people sleep on. It is so soft, so it makes the perfect backing for this comforter cover. I still need to paint the little side tables with the yellow chalky-finish paint. I hung other curtains over the shelves with all of my craft stuff. I still need to get a steamer and steam everything to get all of the wrinkles out. Here's how I covered my comforter. I started by sewing the two twin sheets together. 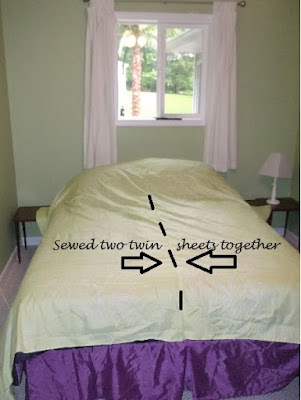 Then, I laid the King-Sized flat sheet on top of the sewn-together twin sheets with the right sides together. Then I pinned one side together so that I could start making the comforter cover. It was easiest for me to do this directly on the bed, so that I could get everything straight and smoothed. 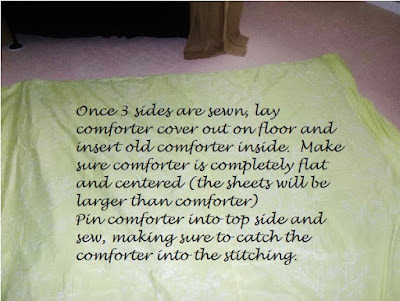 I sewed both sides and the top together and left the bottom edge open so that I could insert the comforter in. 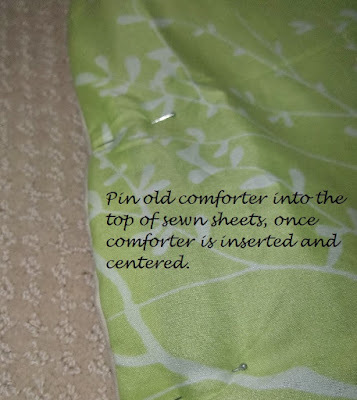 I debated about whether to just slide the comforter in and place velcro at the bottom so that I could remove the comforter, but decided that it would be better to sew the comforter into the sides so that it wouldn't move around. I'll just wash it as is. Once you have the two sides and top sewn, turn right side out and insert the comforter. I did this on the floor in my Master Bedroom where I have enough room for it spread all the way out. 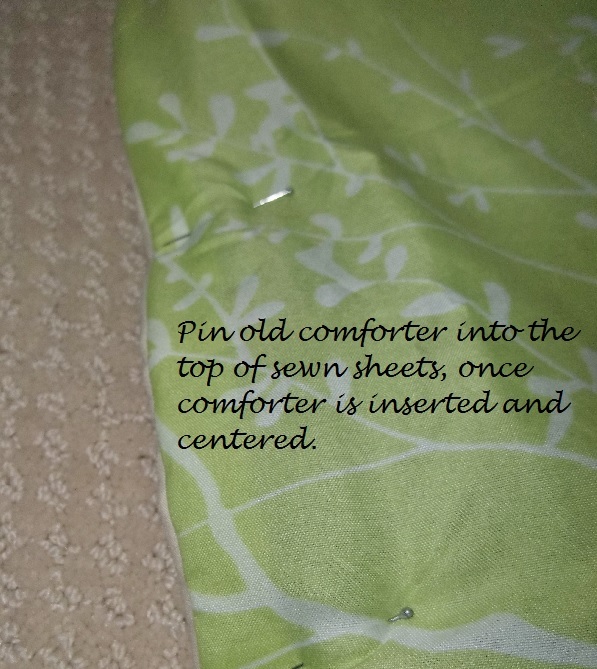 Once I had the top side sewn in, I placed my comforter back onto the bed so that I could see where to pin the sides so that I could sew the side edges into the new comforter cover. The sheets were longer on the sides than the comforter. I just pinned through the 3 layers right on the edge of the comforter. 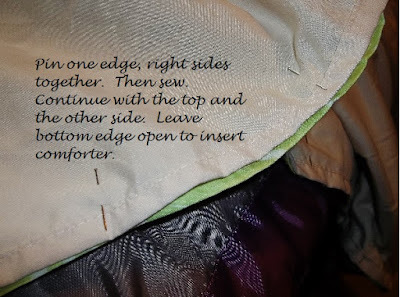 When I sewed, I used the pins and the edge of the comforter as my guide. Once the sides were sewn, I pinned the bottom. I did not sew the bottom edge of the comforter into the seams. I sewed below the edge of the comforter. I figured it was fine with the comforter sewn into three out of the four sides. Since the King sheet was longer than the green twin sheets on this side, it looks like a bed skirt on the end. I'm happy with how it turned out. It wasn't too hard of a project. The hardest part was maneuvering that big old thing around the sewing machine and remembering to pin it the correct way so that it was always off the correct edge of the sewing machine. I'm used to much smaller projects on the sewing machine! It allowed me to update the craft room without having to go out and spend money on a new comforter! 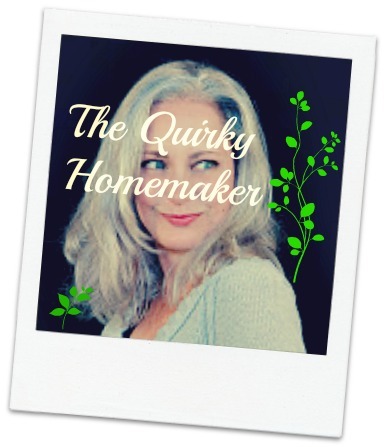 Frugal score for the Quirky Homemaker! I'll post new pics once I get the tables painted and the shutters hung. What creative pursuits have you been working on? 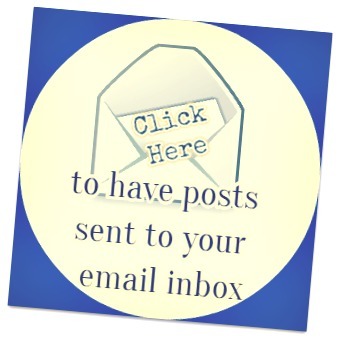 What's Making Your Life Awesome?